Extra space for BBQ equipment and outdoor furniture and perfect for drying washing in wet weather! Before you do build a carport it’s important to consider several factors. For example, where is the best place for a carport to be located? In some cases this is in front of a garage, but you might also consider building your carport adjoining your home. 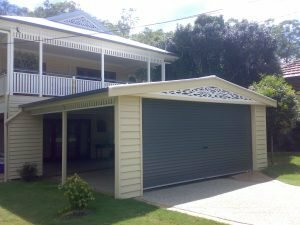 Other factors to consider include the size of carport you want; single, double or tandem and whether you want to fully or partly enclose your Illawarra carport. The type of materials is an important factor for those concerned with maintenance and longevity of their carport. Timber is a common choice for a carport in Illawarra, because it’s economical and a beautiful product. However, steel and aluminium can be better choices if you’re looking for a virtually maintenance-free carport that will last for decades. Whatever materials you’re considering, you can rely on Outside Concepts in Illawarra to provide the advice and service you need. We’ll help you make all the important decisions and provide a free design and quote at your home. Generally we can do this on the spot.